A spicy holiday treat, gingerbread is often thought of during the holidays in the form of delicious men with gum drop buttons. But the flavor of gingerbread can be used for a variety of delicious treats – starting with different cookie-based concoctions. Gingerbread was first brought to Europe by the Armenian monk Gregory of Nicopolis who taught preparation of the treat to French priests and Christians. German immigrants brought it to Sweden during the 13th century. Historic references note Swedish nuns were breaking gingerbread to ease indigestion starting in 1444. Similar to the Middle Eastern recipes, English gingerbread is denser, molasses-based, spice cake or bread. 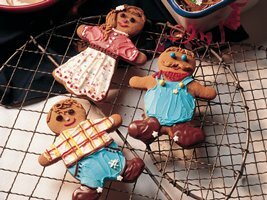 Gingerbread is made in two forms in Germany: a soft form called Lebkuchen and a harder form, more closely associated with street markets and Christmas fairs. The latter kind is made in decorative shapes often decorated with icing and sweets. It’s this harder type which many people are familiar. It’s turned into little gingerbread men and houses. This is the kind of thing that can be a creative challenge! Why build any ‘ol house when you can attempt to replicate a palace or the Taj Mahal. Your gingerbread men can be astronauts, hula dancers, ninjas or princesses. This could be a challenge of color and sweets. Before embarking on this gingerbread challenge, you’ll need a good breakfast. That’s why we’re using on of Chef Gigi’s favorites this week: gingerbread pancakes! Whisk together flour, brown sugar, baking powder, baking soda, salt, and spices in a bowl. Whisk together water, eggs, butter, and lemon juice in a large bowl. Add flour mixture and whisk until just combined. Let stand 15 minutes (batter will thicken). Brush a griddle or 12-inch non-stick skillet with oil and heat over moderate heat until hot but not smoking. Working in batches of 3 or 4, pour a 1/4 cup batter per pancake onto hot griddle and cook until bubbles appear on surface and undersides are lightly browned, 1 to 2 minutes. 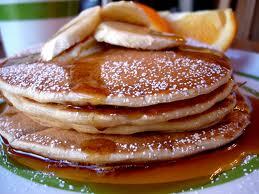 Flip pancakes with a spatula and cook until cooked through and edges are lightly browned, 1 to 2 minutes more. Transfer to a platter and loosely cover with foil to keep warm. Brush griddle with oil between batches.